The Gorkha Janmukti Morcha has decided to hold a series of public meetings across the hills from November as a prelude to its statehood agitation and hold a programme in New Delhi during the winter session of Parliament. At a meeting of the Morcha's central committee, frontal organisations and various other wings at Malidura, 7km from here, the party also decided to include leaders from the Dooars and Terai in top positions to make the outfit more inclusive. Roshan Giri, the general secretary of the Morcha, said: "At today's meeting, it was decided that we would hold a series of public meetings in Darjeeling, Kalimpong, Kurseong, Mirik and Sukna to tell the people about the need to start a renewed agitation for statehood... the state government is dividing the hill communities to weaken our statehood demand. We need to be united in this agitation." 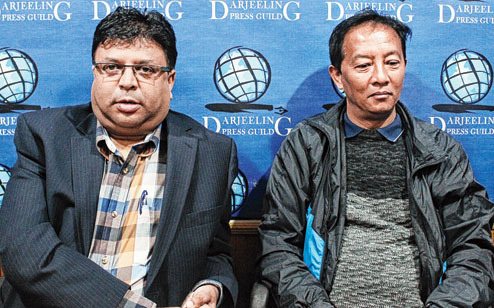 The party will hold public meetings in Mirik on November 6, Kalimpong on November 13, Kurseong on November 20, Darjeeling on November 27 and Sukna on December 4. "The winter session of the Parliament is also starting on November 16. All elected GTA Sabha members, councillors of municipalities, and members of the Nari Morcha, Yuva Morcha, Vidyarthi Morcha and representatives of other frontal organisations will also organise a programme in Delhi from December 9 to 16," said Giri. He, however, refused to divulge the details of the Delhi programme. Sources in the Morcha said the party had decided to start a fresh Gorkhaland movement. Giri, however, said: "The agitation will be democratic in nature." Binay Tamang, the assistant general secretary of the Morcha, said: "Since this agitation will be decisive, we do not think we will provide relaxation as was the case in the last phase of agitation." During the last phase of agitation, tea gardens were given the exemption. At times, the Morcha's agitation would only be targeted on state and central government offices.